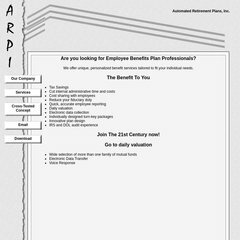 www.A-r-p-i.com - Automated Retirement Plans, Inc. Topics: Services, Cross-tested Concept, and Download. There are 3 Nameservers, ns.specialsystems.net, ns.num.net, and ns.nitf.net. It is hosted by Special Systems Inc (Virginia, Fairfax,) using Microsoft-IIS/6 web server. The programming language environment is ASP.NET. PING www. (24.248.166.81) 56(84) bytes of data. A ping speed test response, is timed at 35.8 ms.